Washington DC is one of the most vibrant cities in the U.S. Forget politics; DC is jam-packed with museums, historic sites, Parisian-style buildings, parks, street food, and youthful energy. 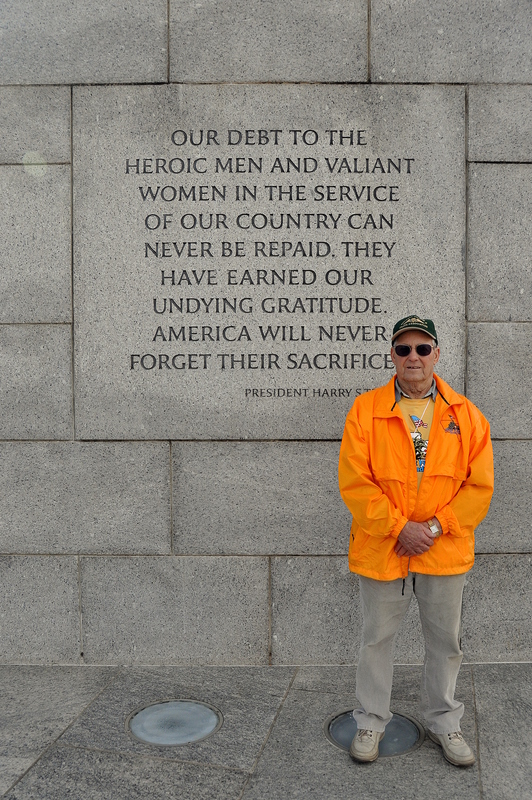 I have had the opportunity to visit Washington three times. The first time was as an infant, and I allegedly cried so much that I ruined the trip for my parents. The second time was in August of 2001, for a national fraternity conference, during which I skipped out on most sessions in favor of sightseeing. The third time was one year ago, when my friend Jenny invited me to explore the city with her and hopefully land a job interview or two. The job interview portion was an epic fail, but I did get to revisit some favorite places and further explore the city’s superlative National Mall. 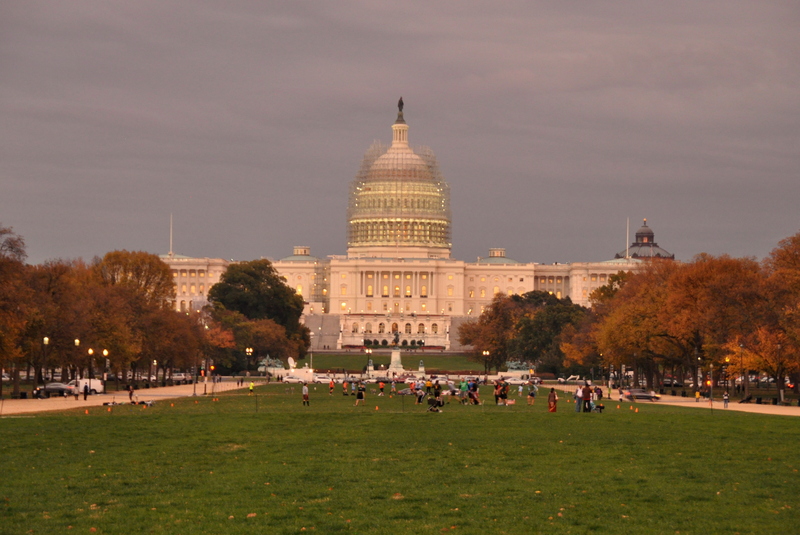 The Capitol Building towers over the eastern end of the Mall from its perch atop a slight hill. The Senate and House of Representatives meet here, and have offices both here and in surrounding buildings. Note the fall colors on the trees, perhaps ten days from reaching their apex. 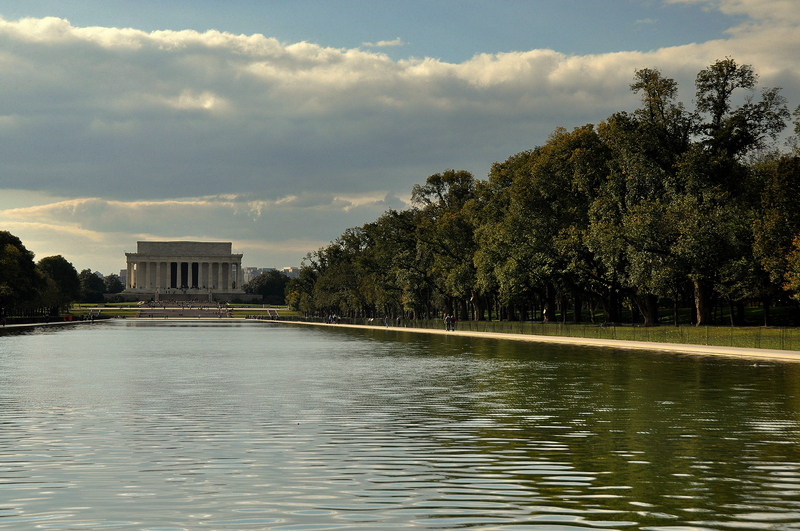 The Lincoln Memorial marks the opposite end of the Mall. It is here where Honest Abe sits, one foot forward and one fist clenched. It is here where Vietnam veterans still insist that they have comrades held captive in Southeast Asia. And, in a pop culture watershed, it was here where Forrest Gump declared his love for childhood friend Jenny as thousands of extras-turned-hippies cheered him on. My own friend Jenny played one of them! 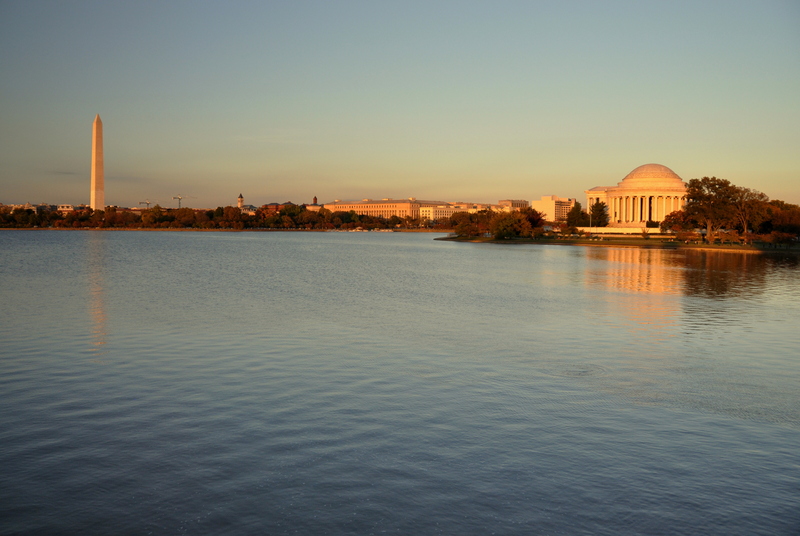 The tidal basin, seen above, is technically an offshoot of the rectangular Mall, but it remains a perfect place to take in the orange light of dusk and watch the Washington Monument and Jefferson Memorial reflect off the water. The Jefferson Memorial sees just a third of the visitors of the more popular Lincoln Memorial, but that is surely due to location as much as anything else. It is worth seeking out. 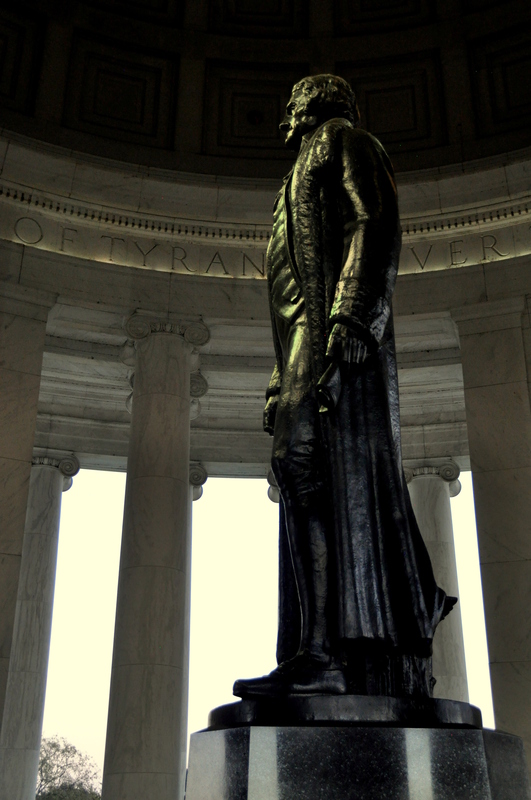 The third president of the United States, the author of the Declaration of Independence and arguably one of the smartest Americans who ever lived, Jefferson deserved – and got – a monument befitting of his intellect. The Washington Monument can be seen from almost anywhere. In the picture above, it peeks above the trees in the background while Rev. Martin Luther King, Jr. stands steadfast as he looks out over the Potomac. 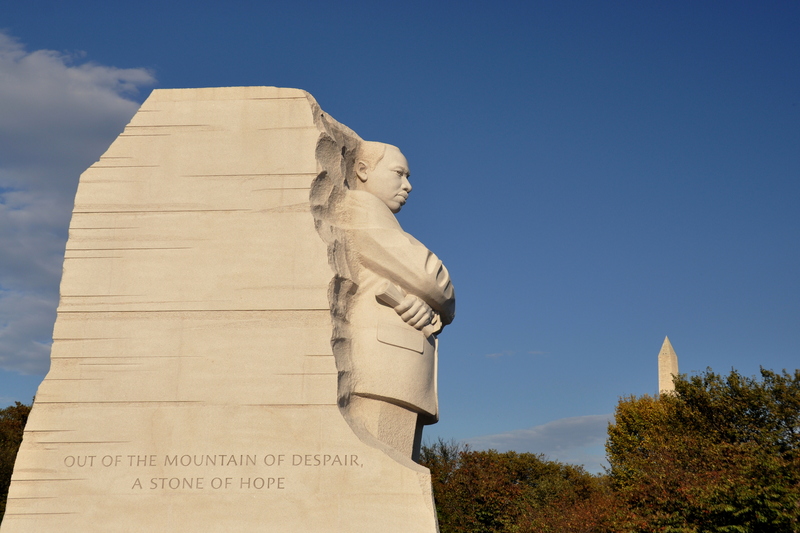 The MLK Memorial, dedicated in 2011, is a recent addition to the National Mall. It stirs one’s soul. Another recent addition, and one that fits in seamlessly with everything else on the Mall, is the World War II Memorial. 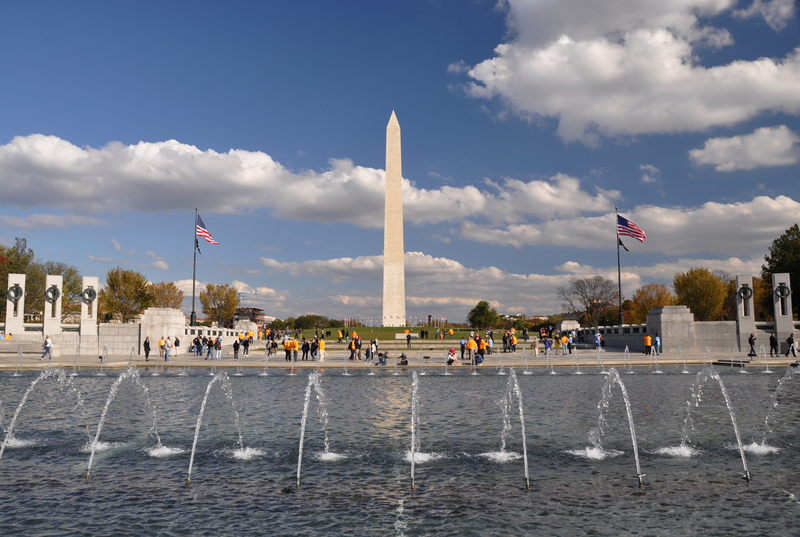 Two semi-circular pylons mark the 48 states and U.S. territories that served in the war, and a tasteful fountain in the middle of the large space pays tribute to those soldiers who lost their lives in the Great War. 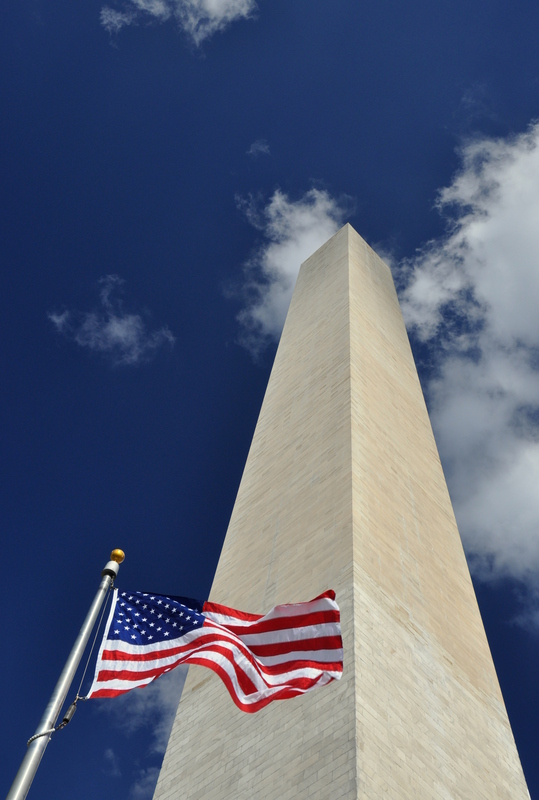 The Washington Monument, flanked by American flags, marks the view of one side while the other side faces the Lincoln Memorial and Reflecting Pool. The man above is a veteran who fought in the Korean War. A plane full of WWII, Korean, and Vietnam veterans from the Midwest descended on DC for the day and were escorted around the city’s monuments. The tide of war has changed since the 1950’s, when he fought. Today, a free trip to Washington for our veterans seems a better use of our taxpayer dollars than spending it on another unwanted war. That’s just my $0.02. We should take care of our troops, both abroad and back home. As I did then, I thank this man again for his service. 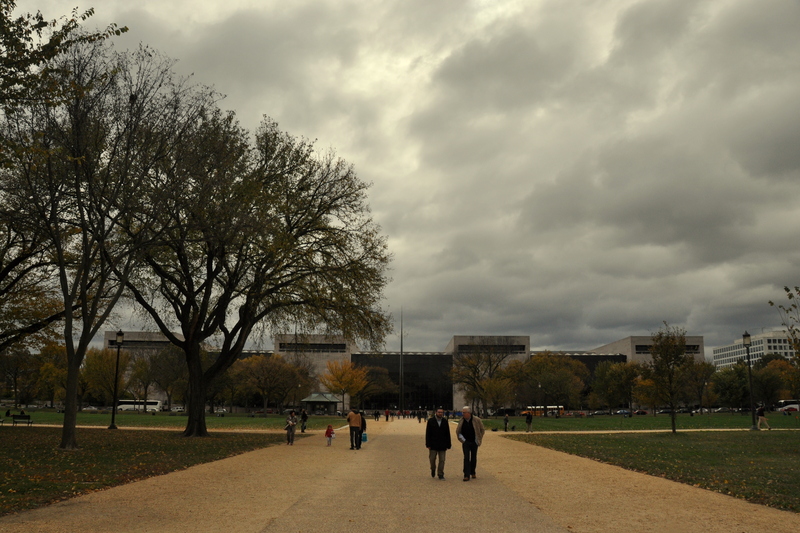 Overcast skies and low-hanging clouds loom over the Smithsonian’s National Air and Space Museum. Behind me is the National Gallery of Art, which I later learned is not associated with the Smithsonian, although other, smaller galleries along the Mall are. Confused? So am I. Moon rocks, an Apollo 11 capsule and Cold War rockets are just a few of the scientific and technological wonders on display inside the Air and Space Museum. 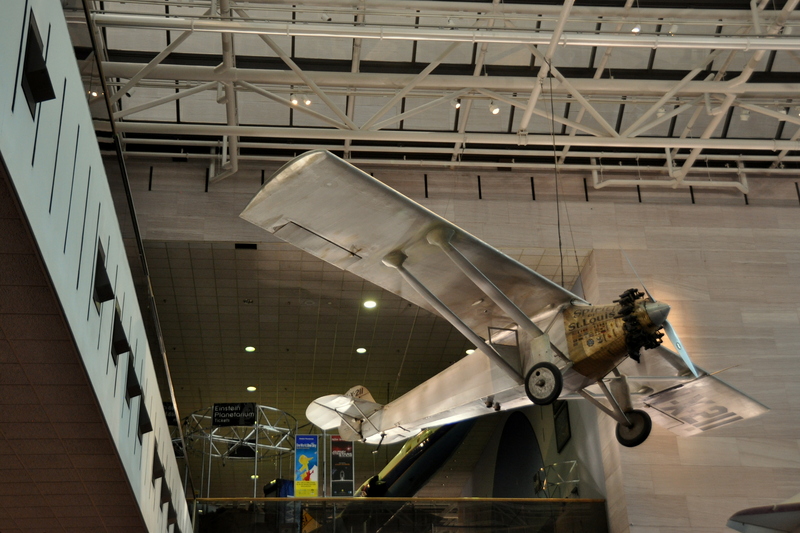 Above is Charles Lindbergh’s Spirit of St. Louis airplane, which Mr. Lindbergh flew solo from New York to Paris in 1927. No small feat. 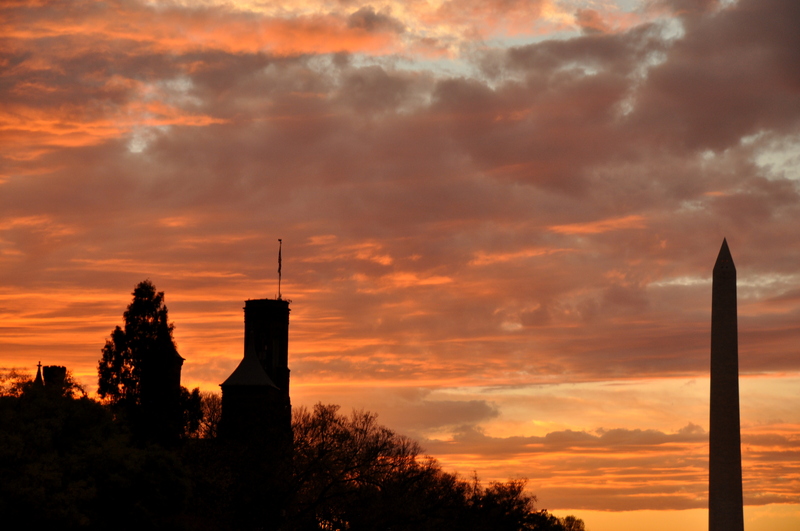 Speaking of the Smithsonian, the silhouetted tower in the lower left of the above picture is the Smithsonian Castle. This Romanesque/Gothic construction, built entirely of red sandstone, was once the Smithsonian Museum itself. When you consider that the collection today is divided among several buildings that comprise nearly half the Mall, it doesn’t seem possible that a single building once sufficed. This marble rotunda-like monument is the DC War Memorial. 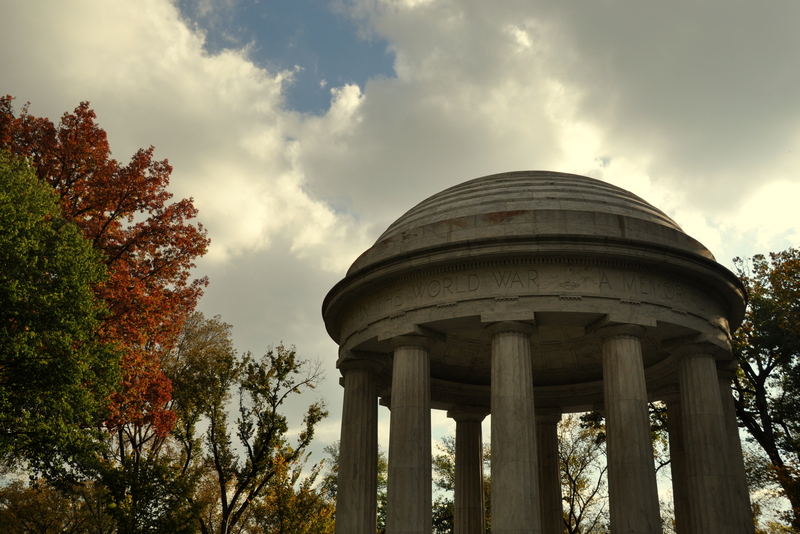 The Doric temple-style structure was inaugurated by President Hoover on Armistice Day in 1931, and honored the 26,000 Washingtonians who served in World War I. Clustered amid a grove of trees, the DC War Memorial is one of the most peaceful places along the entire Mall. 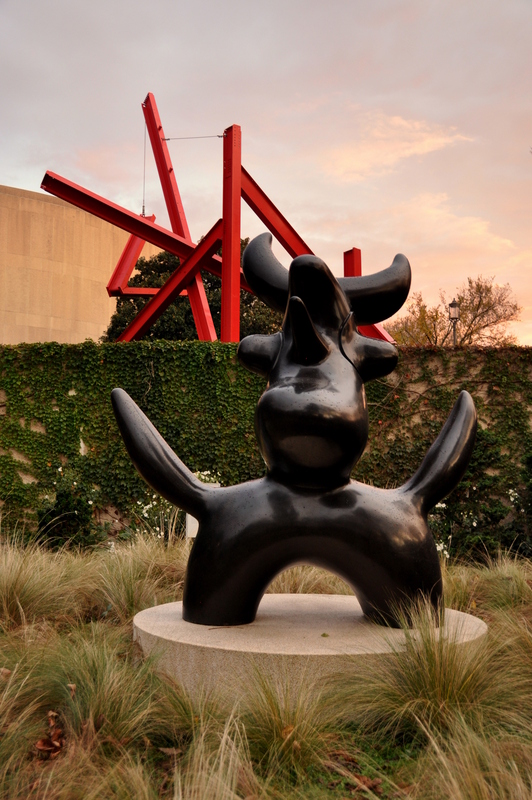 Wander off the main path and you might stumble upon something like this: a Joan Miró sculpture. The sunken DC Sculpture Garden is a rewarding, five-minute detour as you stroll from the Smithsonian Castle to the Air and Space Museum. 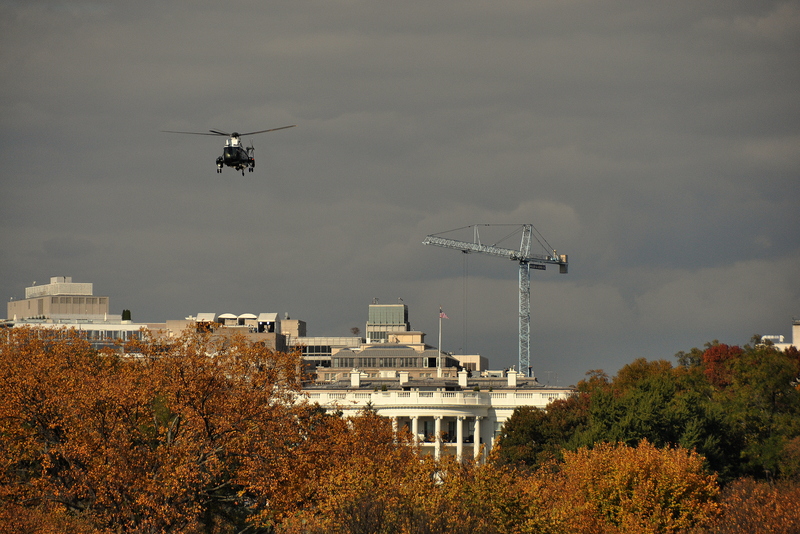 I was taking pictures near the Washington Monument when I heard the sound of approaching helicopters. I turned and saw Marine One, escorted by two other choppers, flying towards the White House, which is just visible behind the trees in the picture above. I lingered for awhile, and, moments later, they lifted off again, with Marine One the last to take off and with President Obama presumably on board. Thrilling. With its collection of museums and monuments as well as its innumerable photo opportunities, the National Mall of Washington, DC is one of the most impressive places to visit – in the U.S. or anywhere. The following slogan, translated from the anonymous Italian saying “non basta una vita,” was fashioned for Rome, but applies here as well: A lifetime is not enough. There weren’t millions of extras for Forrest Gump…. there were only 300 of us, making it look like 50,000 by filming the same scene over and over and over for 2 days (all around the pool). And, btw, Tom Hanks is a very nice person who chatted with everyone and cracked jokes.